Apple’s iPod touch is a great example of one such device. It’s even referenced in the included instructions (see below). Other examples include the PlayStation Portable (PSP) and Nintendo DS Lite or Sony’s latest WiFi-enabled Walkman. As more and more non-PC devices add support for WiFi – eBook readers, media players, MIDs etc. 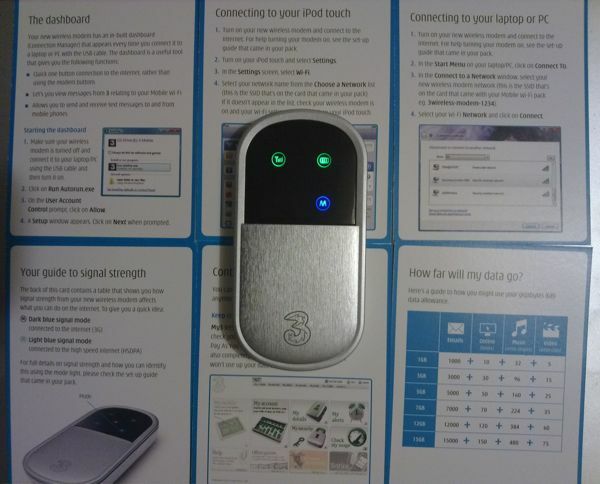 – a device like the MiFi will become infinitely more appealing than a single purpose 3G dongle. Generally, the MiFi is dead easy to use and the accompanying instruction cards do a good job of walking you through the set-up. The only real complaint or shortcomings are the overly minimalist LED indicator lights, which don’t give you any idea of 3G signal strength and battery level, aside from telling you when you’re nearly out of juice. And battery life itself. The MiFi packs a 1500mAh battery, large for a cellphone but could be larger still for the job in hand. It should give you about 5 hours max of 3G to WiFi goodness, although you can also power the MiFi over USB or using a mains adapter.